Autumn is very much in the air here in England. (Mind, it has been all summer. ;-)) The nights are drawing in very quickly and it's cool and rainy, although that's not to say it won't suddenly turn around and present us with a dry, warm September. I kind of hope not as I prefer a moody autumn to be honest. But there you go, what I'm actually here to say is that it's that time of year again - time for Carl's creepy books, reading extravaganza - R.I.P. VII. And what amazing artwork... perfect, imo. It's by Donna at Gothicrow apparently. Anyway, Carl's post about R.I.P. 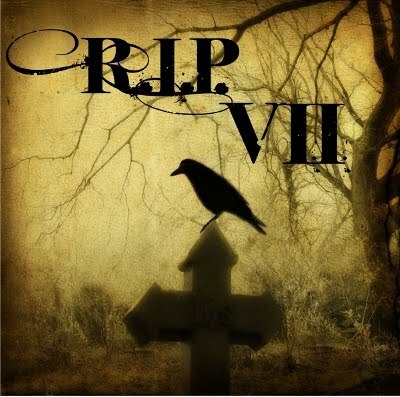 VII is here, for those that want to check it out and maybe get involved. Of the various levels of participation I'm going to do Peril the first. I seem to have gathered a substantial pool of books to choose from, not quite sure how that happened, I'm starting to wonder if I do it automatically come mid-August. Sort of a subconscious thing... lol. A reread of any of Chris Priestley's 'Tales of Terror' books. Quite honestly, it'll just depend where my mood takes me as to which of these I read and for me that's part of the fun. I'm also sure there'll be more books added to this list as I see what others are reading. Well, I really haven't done very well at blogging this month. I plead the Olympics, a few days being unwell this past week, and next week I won't be here, I'll be in Cardiff. So it's a quick post today or none until almost the end of the month. And it isn't even as if I haven't been reading, because I have. Four books this month as a matter of fact. So I thought I'd do a very quick word about each of them to bring me up to date. 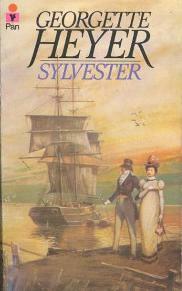 The first book of the month was a reread of my favourite Georgette Heyer - Sylvester. Sylvester, Duke of Salford has decided it's time he married. He's not in love, or of a romantic persuasion so just needs a suitable girl. 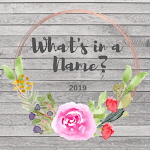 He goes to check out Phoebe Marlow, the daughter of a late friend of his mother's who lives, not that happily, with her father and step-mother and sisters. Phoebe takes offense at being looked over like a horse and takes flight with a child-hood friend, Tom. Sylvester has already lost interest in the girl and leaves but comes upon the two in an inn after they've crashed their carriage. Thus begin his adventures looking after the two and escorting Phoebe to London, where Phoebe turns out to be not at all biddable and falls into scrape after scrape. I've read this one four or five times now, and it's always fresh and delightful. I have other favourite Heyers, Frederica, Arabella, Venetia, The Black Sheep and so on but Sylvester is the one that keeps asking to be read... and so I do. 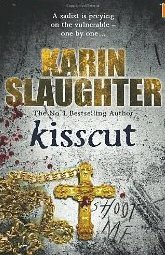 Next, Kisscut by Karin Slaughter. I'm pinching the Amazon synopsis for this as the book went back to the library. When a teenage quarrel in the small town of Heartsdale explodes into a deadly shoot-out, Sara Linton - paediatrician and medical examiner - finds herself entangled in a horrific tragedy. And what seems at first to be a terrible but individual catastrophe proves to have wider implications when the autopsy reveals evidence of long-term abuse and ritualistic self-mutilation. Sara and police chief Jeffrey Tolliver start to investigate, but the children surrounding the victim close ranks. The families turn their backs. Then a young girl is abducted, and it becomes clear that the first death is linked to an even more brutal crime. And unless Sara and Jeffrey can uncover the deadly secrets the children hide, it's going to happen again... Not for the faint-hearted this one. I mean *really* not for the faint-hearted. It involves child-abuse which is something I'm normally not happy reading about but Karin Slaughter's writing tends to carry you through and so it did this time. An excellent read and I'm happy to have book 3 of this Grant County series on my library pile. 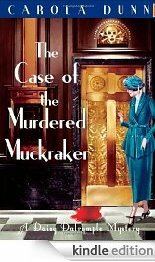 Next, The case of the Murdered Muckraker by Carola Dunn. Daisy is in New York meeting her publisher while husband, Alec, is in Washington advising a gov. dept. She's staying in the Chelsea hotel and soon becomes entangled in the various comings and goings of the other guests. Visiting her publisher, Daisy sees one of the hotel guests is there, a newspaper man, Otis Carmody. Suddenly there is a shot and Otis Carmody plummets to his death down a lift-shaft. Daisy's done it again - fallen over a dead body. Eventually, Alec joins her and the two set about trying to find out which of the hotel guests was the murderer. Another delightful Daisy Dalrymple book. I loved the 1920s American setting, the quirky guests in the hotel - especially the two elderly sisters - and the flight across America that Alec and Daisy end up taking in order to get their man. Huge fun. 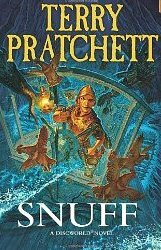 Lastly, Snuff by Terry Pratchett. Sybil has taken her husband, Sam Vimes, Commander of the Anch-Morpok city watch, away for a holiday. This is problematic partly because Sam is addicted to his job, but also the place he's being taken to, Sybil's ancestral home, is in the *country*. Sam is a city boy through and through and wants no truck with the countryside. Young Sam, their son, is in his elememt though as his new obsession is animal poo, of which there is an abundance out in the country. Once there, it doesn't take Sam long to discover that something isn't right. But what? His policeman's nose can sniff a mystery a mile off but first he has to find out what the secret is. It doesn't take him long. Unfortunately it also doesn't take him long to get himself arrested for murder... I think this is book 8 of Terry Pratchett's Sam Vimes books, which is also part of his larger, Discworld series. I've read and loved them all and this one's no exception. In fact, I thought this was the best, although The Fifth Elephant is very close behind. The mix of comic fantasy and mystery is a brilliant one, and Terry does humour better than anyone writing today, in my opinion. It's subtley done and I chuckled my way through the whole thing. Aside from that there is a serious theme to the story... that of how we treat a race of beings we consider to be vermin despite the fact that they have artistic and musical talent and language. Extremely thought-provoking. I wish some of the biggoted idiots we have in the world today could be force-fed Terry's books. Simply wonderful, this book, likely to be in my top ten for 2012. So that's it from me for a while. RIP might be my next post at the end of the month, or there may be Welsh photos, we'll see. The Olympics has me in thrall at the moment so I'm not reading as much as I might be. I honestly did not expect to be as hooked as I am but there you go, The Games in your own country is a rare occurance and I suspect I will not see it again, so am making the most of it. In the meantime, while there are no actual book posts from me, here's a book meme I nabbed from a friend. Minnow on the Say by Philippa Pearce (amongst many). Buying books and then having them sit on the shelf, unread, for years. About 7 books, mainly crime I think - Karin Slaughter, John Connolly, James Lee Burke, a Raffles short story volume by E.W Hornung. I do indeed and I love it to bits. It will never replace real books for me but I love to use it as an extra reading tool. Mostly just one but if a book is particularly scary then I tend to have something lighter on the go for bedtime reading. And sometimes I'll be reading a non-fiction alongside some fiction. Yes. I read a lot of blog reviews and tend to buy recommendations or get them from the library. I'm sure my newish obsession with crime books is down to blogging... in fact I know it is. Hmm. Not sure I can name just one! OK, *one* of the best was Blindsighted by Karin Slaughter. Probably not as often as I should. 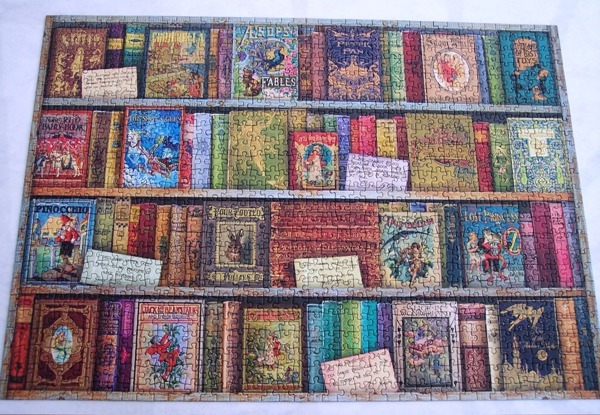 I like what I like and tend to stick to it as, for me anyway, reading is for enjoyment. I don't go on the bus any more but when I used to travel by coach occasionally, yes I could read on it. My favourite chair or in the conservatory where the light is excellent. I tend to lend to my daughters only, mainly because I don't know any others that read. If I did I think I would be careful as I do like to get my books back eventually. I may have when I was at school. Imaginative plotting - I like to be taken by surprise. A spot of romance. Good writing. Anything but it's a difficult area as you have to consider strongly what the person may or may not like. People's tastes vary enormously. Not long ago I would have said fantasy/horror and I still love those but right now I would have to say that I love crime and mystery stories. I can't think of an answer to this. I'm an electic reader and will read most genres and do. Maybe westerns? Wait For Me by Deborah Devonshire. I'm struggling to define 'inspirational' to be honest. Um... Down Under by Bill Bryson was such a brilliant book about Australia I suppose I could be said to have been inspired by it? I don't really read things that professional critics review. I like to say what I think but hope I'm never cruel. I always stress too that this is only my opinion, others might have a different experience. This is pathetic but 'none'. I don't tend to be intimidated by books, I tend to hope I'm capable of reading anything I put my mind to. I'm not nervous of books, but a possible answer might be War and Peace *if* I had any interest in reading it, which I don't. I don't have one. Poetry is something I wish I knew more about. I tend to have favourite poems such as The Way Through the Woods by Kipling but I honestly can't say I've read enough of any one poet to have a favourite. Anywhere from 3 to 10. I try to restrain myself but rarely have any luck with that. Oh lord. Soooo many. I'll plump for a current favourite - Det. Insp. Alec Fletcher from Carola Dunn's Daisy Dalrymple books. I love how long-suffering and tolerant he is. 40. Books I'm most likely to bring on vacation? Just something I know I'm going to love. I usally take several, plus my Kindle. Loads. I don't make myself finish books I don't like anymore. I also instantly forget them so I can't remember any titles. 43. What distracts you most when you're reading? My husband fidgetting. My grandaughter has inherited this gene. 46. The most money I've ever spent in the book-store at one time? No accurate idea but I would tend never to spend more than about £25. Average for me in a bookshop is around £15 to £20. I wouldn't get as far as that I think. If I'd managed halfway I'd probably plough on. Yes. Kind of. I'm a bit random in my organisation though. It depends on how much I liked the book. If it's a keeper, I keep it, if not it goes to the charity shop generally, or passed on to one of my daughters. I don't tend to avoid books. I suppose I'm not planning to read Fifty Shades of Grey but I'm not sure if that qualifies as *avoiding*. I just don't fancy it. Can't name a title in particluar but books about the holocaust that I've read in the past. Twilight. Although I try not to be prejudiced about books before I start them. Er... no guilt here... sorry. It's all guilt-free as far as I'm concerned.